Bohol's mysterious Chocolate Hills are the island's premier attraction and is considered the Eighth Natural Wonder of the World. Ranging from 40 to 120 meters, the 1,268 hills resembling giant scoops of ice cream, is really a wonder during summer or the dry season because the hills would turn into their magnificient chocolate brown color. 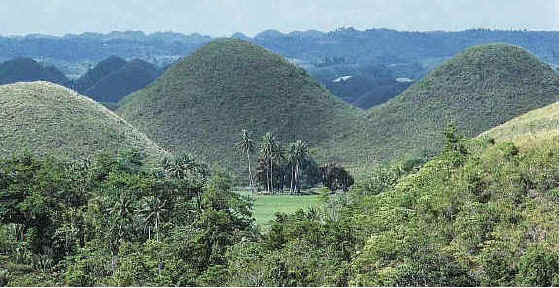 Among the thousands of these coneshaped hills which dotted on the plains of Carmen, Batuan and Sagbayan, two (located in Carmen) have been developed into a resort with lodging.